With that said I've decided that its better late than never because their were some products that really stood out to me this month. So with that said lets dive in with a short post on some of the items I found myself reaching for ALOT in February. Stay Matte but Not Flat- I bought this foundation as as an alternative foundation for everyday and less dressed up events to avoid using more expensive foundations that I have and my goodness this foundation wasn't just a cheap alternative. Despite I am planning to write a full review on this foundation I found the quality of this foundation for the price amazing and I ended up wearing it both on casual days and for dressed up evenings.You can see me wear it in a makeup look I did for Valentines Day Here!. And I am planning to get a few more bottles just in case they change the formula.This product retails at £6 and can be found Here! Nyx Dewy Finish Spray- Despite I didn't take it on holiday, before I left I keep reaching for this every time I did my makeup I didn't spray it all over my face but I sprayed a little on my brush and added it to my cheeks and I found it helped in creating a more dewy look on a matte foundation especially because winter can be so drying. The product retails at £7 and can be found Here! Nyx Full Throttle Lipstick in the Shade Sandman- I've literally had to hold myself back when wearing this lipstick I'm sure I probably wore it to nearly every dressed up evening and even some non dressed up events. It is just a very flattering red like a old hollywood red and I think its great for every skin type because I saw a few different skin types wear it on youtube. This is the lipstick I used for my Valentines look and I probably need to repurchase this also (the look can be found Here if you'd like to see it). Also if you would like to purchase it the cost is £5.50 and you can find it Here! 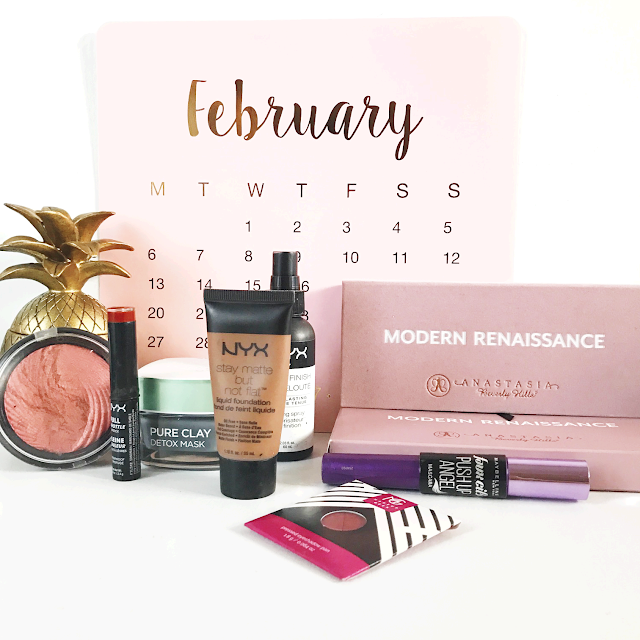 So that's a whole lot of Nyx products but I have really been loving Nyx quite alot this month if you want to see a full makeup look done with all Nyx products let me know in the comments down below. Pressed Eyeshadow Pan- I bought the colour bitten a month ago and I have been using this shade quite alot. I just love it so pigmented and the consistency is so powdery that it blended so well I just need to add some more makeup geek eyeshadow pan to my collection that's all I'm saying. They retail at £6 and can be found Here! Modern Renaissance Palette- This Palette is life that's all I've got to say on it so far. I am still playing around with it because its still very new for me but so far the pigments are insane and I am still learning how to work with it because of that but yes this Palette was my highlight in terms of new buys this month. Pure Clay Detox Mask- Despite I am still trialling this I have to say I have loved using it so far this month. I'm going to do a full review on it on the blog soon along with the other mask so keep your eyes posted for when that post is announced. You can find this mask at quite a variety of retailers cant remember whether I purchased mine from Boots or Superdrug but you can purchase it Here! Falsies Push up Angel- Used it all month loved it all month and I wrote a full review on this mascara with purchase details Here! Baked Highlighter in Rose Gold Lights- I spoke about this highlighter on my Instagram and I did a mini review of this on a haul I did right Here!. I plan to buy a few of their highlighters because I have been reaching for this one so much so I will probably do a post with swatches ect at some point but yes this highlighter is my absolute fave especially when you've got a tan. So that's it for my February Favourites I've been trying out a lot of stuff in March and that post will be a lot more earlier I promise. 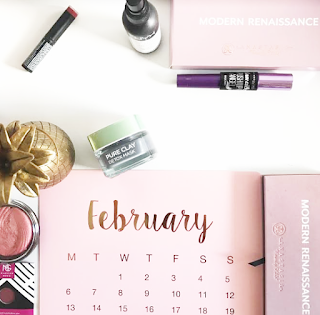 Leave a comment below telling me what you have been loving in February or if any of the products above are your favourites I would love to know. There are so many products on your favourite list that I want to get! The Modern Renaissance Palette being the numero uno! The MG eyeshadows are on my wish list since a long time! I need to get some!